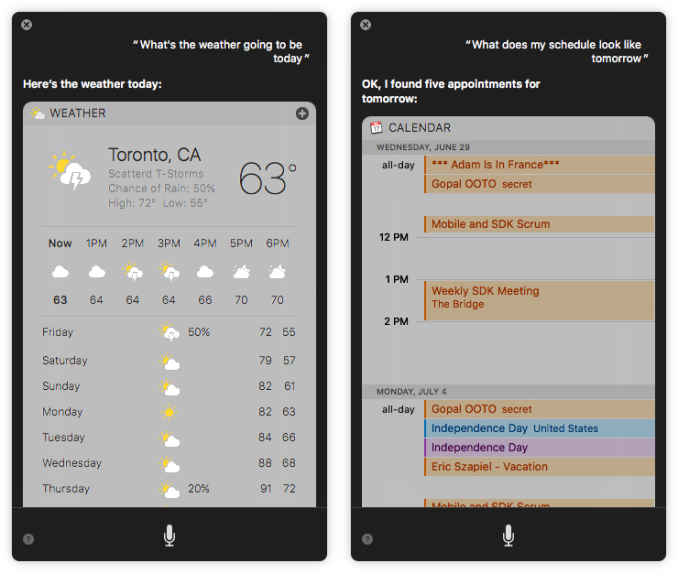 It may not seem like it, but Siri was introduced almost five years ago with the iPhone 4s and iOS 5. Since that time it has been made available across all of Apple's iOS devices, as well as watchOS and tvOS, but it never made its way to what was then called OS X despite the yearly rumor that it would do so. 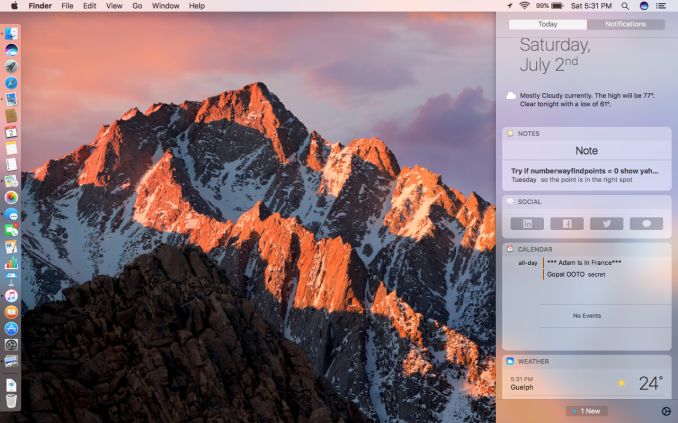 With the introduction of macOS Sierra, Siri has finally been introduced for Apple's desktops and laptops, which means that it's now available across Apple's entire product line. Why Siri took so long to come to the Mac is a question that probably doesn't have a single simple answer. I believe that part of it simply has to due with Apple's increasing focus on iOS leaving the Mac as a lower priority platform for improvements. However, it's also reasonable to assume that making Siri truly useful within the macOS environment required additional work on top of simply bringing it over from iOS. With an operating system like macOS there's a greater opportunity to use Siri for finding files and performing actions that don't really have a counterpart on iOS, which means that Siri's implementation becomes much more complex and requires the ability to respond to a much wider variety of situations and commands than what can be done on an iPhone. Like Siri on iOS, you can make queries that pull information from the net or from local content like your calendar. Above you can see the often used example of an image query from the web as well as a calendar query to see what my meeting schedule looked like the next day. I've found this to be somewhat hit and miss depending on what you search for. For example, Apple was able to correctly pull an upcoming flight from my emails and automatically add it to my calendar, yet when I asked Siri when my upcoming flight to Toronto was she just responded by searching the web for flights to Toronto. Web content pulled in through Siri is interesting on the Mac because you can actually interact with it and move things from Siri's results into other applications. For example, if you make a query where the result is a group of images you can actually copy and paste or save those images without having to first open them in a web browser. In my experience Siri has problems understanding context and semantics. For example, you can see that my test laptop was configured for the US region so it's using some sort of incomprehensible values for the temperature. 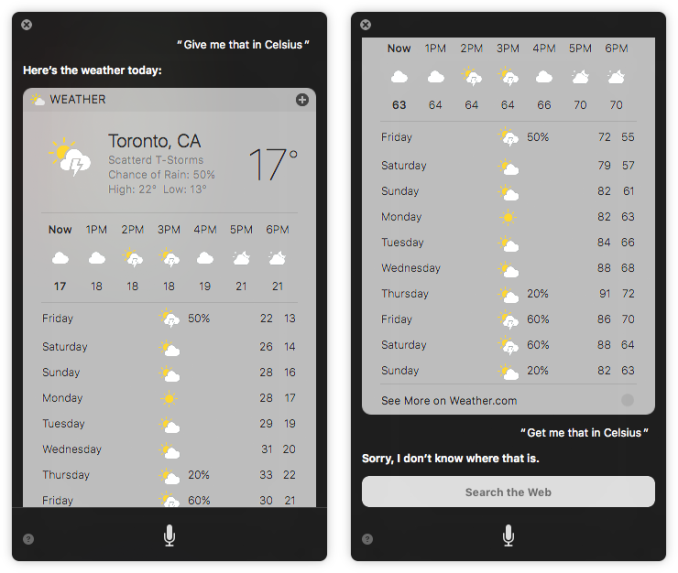 When I asked Siri to "get" me the results in celsius, the query failed because Siri didn't understand what I meant. When I asked Siri to "give" me the results in celsius, the query was understood. The problem here is that as a user, I'm not really distinguishing between Siri getting me something, and Siri giving me something. Within this context, the meanings were basically the same, but Siri was unable to properly comprehend this. As far as information retrieval goes, until you can truly speak to Siri in natural language without having to mind what phrasing you use it's always going to have more friction than simply asking a search engine for the same information. One of the features that distinguishes Siri on macOS from the iOS version is the integration with the file system. You can use Siri to query files no matter where you've stored them, while on iOS there's not really an accessible file system and you can't use Siri to search for documents. Above you can see how I looked for a note that I created a couple of days prior. 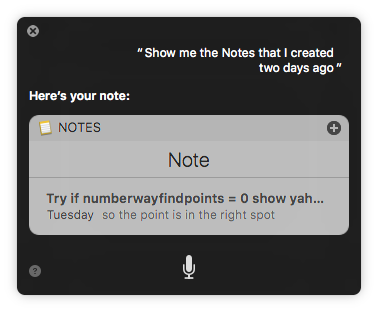 In situations like the one above you may want to keep track of the information Siri gave you for referencing at a later date. To do this Apple provides the plus button on the top right corner of each bubble of information that Siri presents, which allows you to pin the result right into the Today View. I can see situations where this would be useful, but since this test laptop isn't something I use for development I haven't yet come across that sort of situation in the real world. 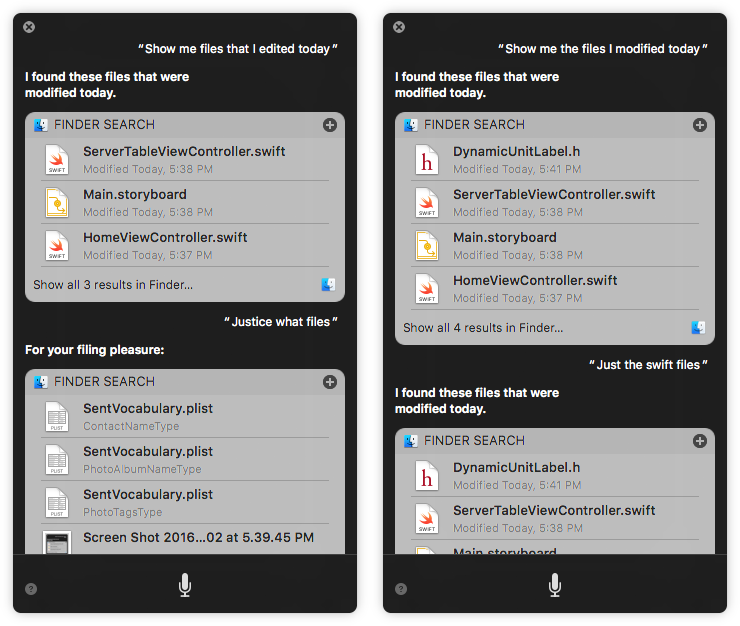 When Apple demonstrated Siri for macOS at WWDC they showed how it can be used to search for files, and how Siri understands additional commands based on the context of previous ones. There was an example of Siri searching for files, and then narrowing it down based on a very specific query involving when the files were last edited, what their content was about, who they were sent by, and how they were tagged. If Siri could reliably perform such actions it would definitely be helpful in finding specific files without having to look through your disk with Finder. Unfortunately, I haven't had near as much luck with complex commands as Apple did in their demo. Above you can see me searching for the files that I modified on a given day, and Siri is not successful in narrowing it down to only the Swift files. If Siri can actually query a file based on a complex list of requirements relating to its metadata, it should be able to do something as basic as narrow down results based on the file type. You can also see in the left image above that Siri for macOS can mangle the voice transcription pretty badly. This has been a recurring issue for me on the 13" MacBook Pro that I've been testing on, and I never have this many problems with Siri on Apple's mobile devices. I'm hoping that this isn't due to the fact that the microphones on Macs haven't been designed and positioned with Siri in mind, but I can't rule that out as a possibility either so I'll have to see if things improve as macOS moves closer to release. Right now Siri feels very beta on macOS, but given that macOS is a beta in itself that's not really unexpected. I think Apple has some work to do with the system integration, and it's actually not clear to me how much happens on the back end and front end respectively so it's hard to say whether Siri is in a good position to be properly functioning by the time macOS Sierra goes live in the fall. It is clear that Apple is adding features as the beta progresses, with an example being the addition of Siri Search for the Photos app in the second developer beta. Right now I can say that Siri is here, and Apple appears to be on their way to making it work as advertised, but I'll reserve any final judgements for when Sierra sees its stable release.